ALL purchases over $29.99 via the "Jack Rack" website ship FREE! The newest must-have music accessory by Pluginz - the "Jack Rack" - is a unique, fun gift sure to please any rocker or musician this holiday season! Already making a name for itself, this eye-catching wall-mounted keychain holder is the best way to "Hang Your Keys like a Rockstar". Just in time for the holiday rush, Pluginz is pleased to announce their new partnership with Marshall Amplification. 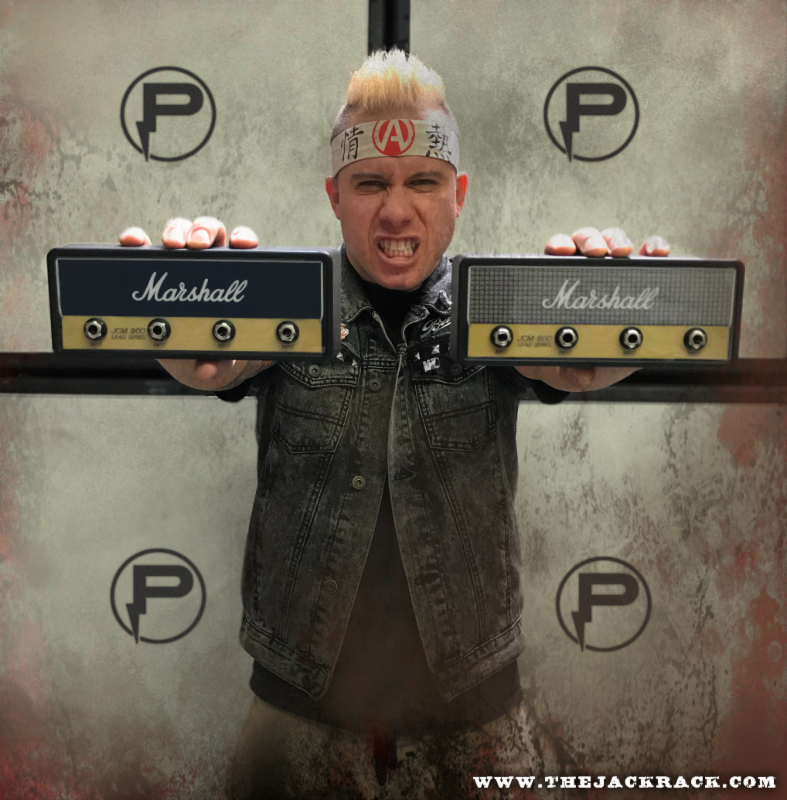 Pluginz has rolled out a brand new line of official Marshall Amps-branded "Jack Racks" that you can pre-order exclusively via www.thejackrack.comandwww.MarshallAmps.com. Marshall "Jack Rack" orders will begin shipping the first week of December. 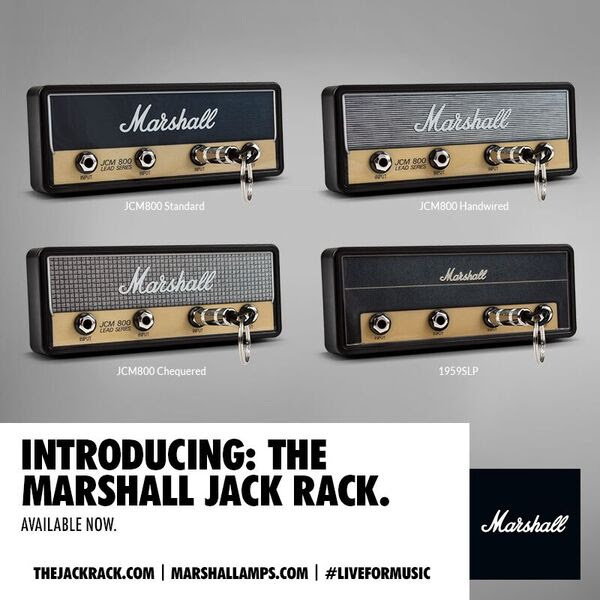 The Marshall "Jack Rack" comes in four different designs (Standard, Handwired, Chequered and SLP), which you can view above or via the "Jack Rack" website. Grace Pantony of Marshall Amplification states, "The great thing about Marshall is that we are a brand that is not afraid to evolve and collaborate, and music is at our core. We continually ask ourselves, how will this product make our customer feel? So when we looked at adding Pluginz "Jack Racks" to our product offering, we were exited to align ourselves with a fun quirky product that we have a cultural connection with. We build products that stand the test of time and have a consistent quality, and we continue that ethos with all our brand extensions. Pluginz is a great brand and we are looking forward to seeing this develop." Mike Stricklin, founder of Pluginz states, "We couldn't be more excited to team up with such a legendary brand such as Marshall! All of us here at Pluginz are musicians ourselves, and we all grew up using their amps. To be able to work with them side by side on a product that we created is a dream come true!" All original "Jack Rack" styles and additional branded designs are also available viawww.thejackrack.com, or via top music gear retailers Guitar Center and Musician's Friend. If you're looking to buy a friend or family member a great gift this holiday season but don't want to break the bank, the "Jack Rack" has designs starting at just $29.99. Plus, all purchases over $29.99 via the "Jack Rack" website ship free! At www.thejackrack.com, you can also buy the individual "Jack Rack" Pluginz keychains (on sale, $4.99), as well as lanyards, necklaces (on sale, $9.99), gift cards and more. Stuff your stockings with the "Jack Rack" and accessories for an affordable price! Not only can you buy your own "Jack Rack", you customize them for your business or brand, too. Reputable music industry companies and huge rock artists such as Dillinger Escape Plan, Asking Alexandria and others are already creating their own custom Pluginz "Jack Rack" designs after witnessing the personalized nature of the product - allowing them to further promote their brands with a fun and functional twist. To find out more on how to customize your very own "Jack Rack", email Pluginz at: contact@pluginzkeychains.com. Pluginz was founded in early 2015 by Mike Stricklin, who soon partnered up with Rockworld Merchandise owners Dan Jacobs of the band Atreyu, and his brother Joe Jacobs.After a successful Kickstarter campaign that raised over $10,000, Pluginz started making a buzz within the music industry. Soon after, the "Jack Rack" went viral on the front page of Reddit, as well as breaking records for post likes, comments, and shares on pages such as Guitar World, Revolver Magazine, Shut up And Take My Money, Celestion Speakers, 100.3 the Sound FM, Alt 98.7, OC Weekly and many more. Pluginz continued to gain steady momentum throughout the year, adding reputable artists and bands to their growing roster, as well as collaborating with famous brands and companies within the industry. The future has a lot in store for Pluginz, as the company continues to grow and spread the word about the "Jack Rack" across the globe. ***Make sure to catch Pluginz and the "Jack Rack" at Winter NAMM 2017! Read more about the Pluginz "Jack Rack" via www.thejackrack.com.